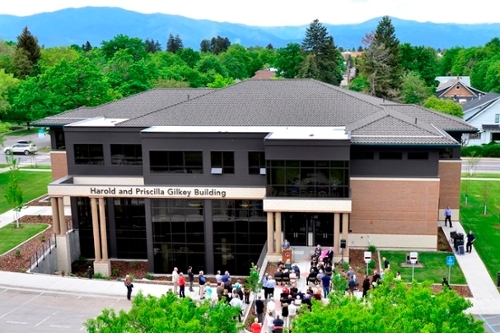 The University of Montana celebrated the opening of its newest campus facility, the Harold and Priscilla Gilkey Building, on Thursday, May 12. Generously funded through private donations, the 31,411-square-foot building is home to new executive education offerings, the Global Leadership Initiative and the UM Foundation. Kate McGoldrick, executive director for leadership, entrepreneurship and executive education at UM, will lead the University’s new mandate to partner with industry sectors, organizations and business leaders to develop their leadership capability and build organizational performance. Using a fee-for-service business model, executive education is expected to be self-sustaining and provide long-term financial value for the University. UM alumni Harold and Priscilla Gilkey made a generous lead gift in support of the project. They were among the 129 donors who provided funds to underwrite construction. “When considering funding for this project, it began as ‘pay back’ but became ‘pay forward,’ as developing true leadership and entrepreneurship through executive education creates many opportunities,” he said. Harold Gilkey is a 1962 graduate of the UM School of Business Administration and holds a Master of Business Administration from the University of Southern California. 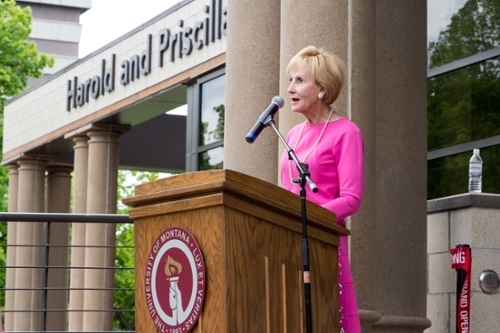 He retired as chairman and CEO of Sterling Financial Corp. Priscilla Gilkey is also a 1962 UM graduate. She retired as vice president of community relations for Empire Health Services, a multi-hospital system in Spokane. Larry Gianchetta, dean of UM’s School of Business Administration, has worked to bring a formal executive education program to UM for over a decade. Now, as he approaches retirement, he feels pride that the school is cementing its reputation as a leader in business education. In addition to the executive education programs, the building is home to the Global Leadership Initiative, an undergraduate certificate program designed to foster leadership skills and a critical understanding of 21st century global challenges, and to the UM Foundation, the nonprofit organization that raises and stewards funds on behalf of the University. The Gilkey Building has received a LEED v4 Gold certification. It is the third LEED-certified building on campus after The Payne Family Native American Center and the Student-Athlete Academic Center. LEED certification prioritizes energy and resource conservation in building design and construction, making it an obvious tool as UM works toward its emissions reduction and sustainability goals. The Gilkey Building will use 24 percent less energy and 34 percent less water than a conventionally designed building of comparable size, resulting in a 32 percent energy cost savings. 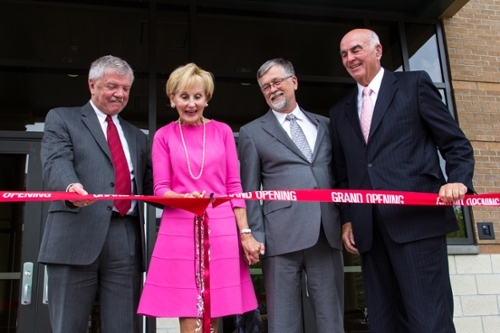 The University used local service providers in completion of this facility. L’Heureux Page Werner of Great Falls designed the building, Quality Construction of Missoula led building construction and Missoula’s Intaglio Design managed interior design and layout for the second and garden levels.